Walmart accused of closing stores to punish activist workers: Union files NLRB complaint. Walmart has suddenly closed five stores, leaving 2,200 out of work, over what it calls faulty plumbing. Workers say they’re being punished for asking for better pay. Following the abrupt shutdown of five stores for what the company calls plumbing problems, Walmart is the subject of a complaint lodged Monday with the National Labor Relations Board alleging the closures are a “retaliatory” move meant to punish workers for demanding better pay and conditions. [T]he retail giant, which employs 1.3 million workers in the United States, temporarily closed five stores—two in Texas and one each in California, Florida, and Oklahoma—for six months of plumbing repairs. The stores closed at 7 p.m. on April 13, which gave workers just a few hours notice that they were losing their jobs. The company provided two months of paid leave for both full-time and part-time workers. Employees could try to transfer to a different Walmart location during that time. 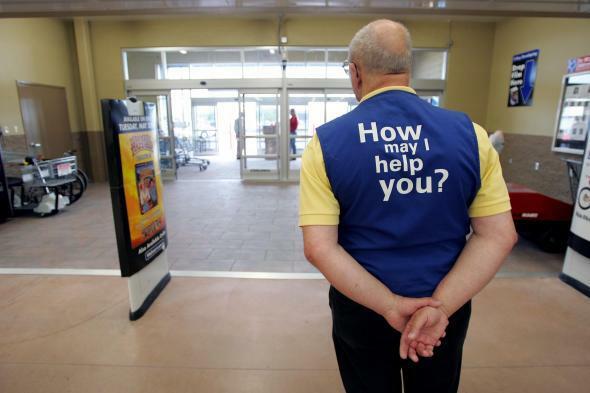 Full-time workers who fail to find another Walmart job are eligible for severance starting June 19, but part-time workers aren’t entitled to that benefit. A Walmart spokeswoman told NBC that the lost jobs were “not layoffs” and that rather than being recalled, employees will have to reapply as new applicants when the stores reopen. The NLRB complaint, filed by the United Food and Commercial Workers International Union, asks for an injunction forcing Walmart to reinstate the 2,200 workers displaced by the closures. Brian Nick, Walmart’s director of national media relations, told Slate by email that “it would be unfortunate if this outside group [UFCWI] attempts to slow this process down for our associates and customers.” Nick further stated that while closing down a store with only a few hours of notice might be unusual, it was nothing nefarious. To your question, this is not a typical occurrence but a decision that wasn’t taken likely to address serious issues at these stores. We did close a handful of stores this year that will not reopen, unlike these five stores that will reopen with improvements. All associates were notified at once. The difficult decision to temporarily close these stores were made for the stated reasons and not any other motives. While Walmart has announced a few initiatives recently to ease tensions with its lowest-paid workers—including instituting a modest wage hike and eliminating a layer of management for workers to navigate at the store level—the company continues to strenuously resist efforts at unionization. The support garnered by OUR Walmart over the past three years represents the closest Walmart employees have come to formally joining a union. Walmart insists the affected workers can ask for their jobs back when the stores reopen with buildings equipped to “better serve our customers and the community in the long run.” There’s no telling exactly how long that will take; an ABC affiliate in Tampa reports that Walmart has not sought any permits to perform plumbing work at those locations. *Correction, April 21, 2015: This post originally misidentified Fortune as Forbes.